Dozens of works of art were secretly taken from a storage facility at Cuba’s flagship National Museum of Fine Arts and some have surfaced across the Florida Strait in Miami, museum and gallery officials said–the Associated Press reports. In an online statement, Cuba’s governmental National Council of Cultural Heritage acknowledged what it called a major loss for the museum in central Havana. “Last week it was detected that there was an important disappearance of pieces from a warehouse of artwork … of the National Museum of Fine Arts,” the council said on Friday. There was no sign of forced entry, and so far it had not been possible to determine when the theft took place. “The wrongdoers cut the works and re-stacked the frames in an orderly way that could not be detected by a simple glance,” it said. 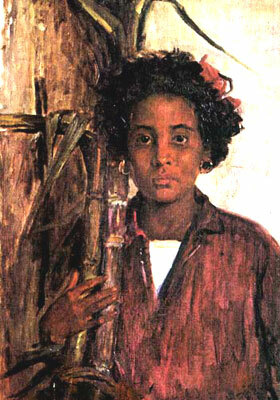 Most of the art taken was from the 19th and early 20th century, in particular pieces by Cuban painter Leopoldo Romanach. Jose Antonio Menendez, director of Cuba’s National Registry of Cultural Objects, confirmed the theft and said at least some of the missing works had been found in Florida. “The investigation is developing and we are concluding an inventory,” Menendez said. He said officials were preparing to distribute information about and photographs of the works “so that everyone is informed and nobody is taken in by a stolen piece of art”. Florida art dealer Ramon Cernuda, who left Cuba as a child in 1960 and runs a gallery in the Miami suburb of Coral Gables, said the thefts came to light after he bought a painting two weeks ago by Cuban artist Eduardo Abela from another local gallery. Cernuda said he researched its origin after the purchase and discovered it belonged to Cuba’s Fine Arts museum. Cernuda returned to the other Miami gallery and saw 10 works by Romanach that seemed suspicious because they had been cut from their frames. An FBI official could not confirm or deny that an investigation was under way.